For months now we have been praising ASK X and how they are leading the way in the user experience for online searchers. As far back as December 2006 when ASK released ASK X, we mentioned the fact that ASK is taking the SERP to an entirely different level by offering more options to help define one's search. We questioned whether ASK was factoring in semantic mapping to provide a better result to the user. 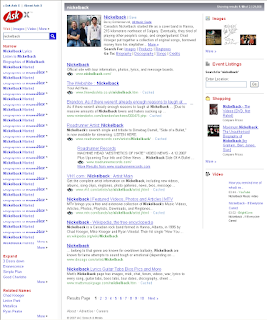 Narrow (my search) featuring Nickelback lyrics, the option to listen to Nickelback and more. Then there is the Expand feature which presents a number of bands and artists in the same genre. There is also the Related section which includes potential related search terms including the names of the lead singer (Chad Kroeger) and lead guitarist (Ryan Peake). The middle panel features the main search results for my query. Over on the right you get some cool information including images, event listings (a convenient way to see if Nickelback is on tour in your area), shopping (which takes you to a catalog-like page for Nickelback items including DVDs, books and the like) and a video section (which includes YouTube and Spin Online video clips of the bands videos). While there is still some room for improvement, I find the user experience on ASK better than on any of the other search engines. I have long said that in my experience, the results returned on ASK tend to be more relevant. If you haven't visited the ASK search engine in a while you may want to check it out. You might like what you see.